If Instagram marketing is a medieval battlefield, you, the social media pro, are the gallant knight and the hashtag is your trusted sword. Wield it well and you will bring honor (brand awareness) to your noble kingdom (company). This guide will teach you how to be as prolific with the Instagram hashtag as Sir Lancelot was said to be with his sword. Learn why you need to be using hashtags, how to use them, and which ones to use to conquer your social media goals. If you need help with the photo- and video-sharing platform beyond the hashtag, discover all our Instagram marketing blog posts, guides, and resources here. An Instagram hashtag is a word or phrase comprised of letters, numbers, and/or emoji preceded by what was once referred to as the pound symbol (#). Instagram hashtags categorize content. Click on a hashtag and you’ll be able to browse posts that have been tagged with it. Attach one to your own photo or video and it will be discoverable to anyone searching the hashtag. How likely it is to be seen by other users depends on how often the hashtag is used, how popular your post is (does it already have a lot of likes and comments? ), and how strong your following is. 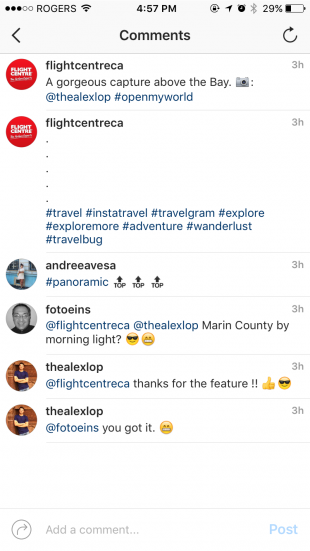 Hashtags help Instagram users discover content and accounts to follow. The right hashtag, or combination of hashtags, will expose your brand to large and targeted audiences. By making yourself more discoverable on Instagram, you have a better chance of attracting new followers, getting more likes, and increasing engagement. Indeed, posts with at least one hashtag average 12.6 percent more engagement than those without, according to a study by Simply Measured. Let’s say you’re a social media manager for a travel agency. There are a ton of Instagram hashtags that are popular with jet-setters: #welltravelled, #justbackfrom, #whatsinmybag, and #passportexpress—to name a few. Tag your posts with any number of those and you will likely get a few extra likes. But if you really want to increase engagement and gain quality followers, include more specific hashtags. If you post a photo of a travel destination, tag it with relevant location hashtags and the resort’s branded hashtag, if there is one. How do you discover hashtags that your target audience is searching? Try the following tactics. When it comes to choosing Instagram hashtags, the golden rule is: use only hashtags that are relevant to your brand, industry, and target audience. #Love is one of the most popular hashtags on Instagram, tagged in over 893 million posts. But your company is not going to attract that hashtag audience if you put it on a photo of your boring boardroom. Continually tag your photos with popular but unrelated hashtags, and someone might flag you as a spammer. Instagrammers aren’t as susceptible to hashtag fatigue as Facebook and Twitter users are. According to a TrackMaven study of Instagram accounts with 1,000 followers or fewer, posts containing four or five hashtags received an average of 22 interactions compared to 14 interactions on posts with zero hashtags. 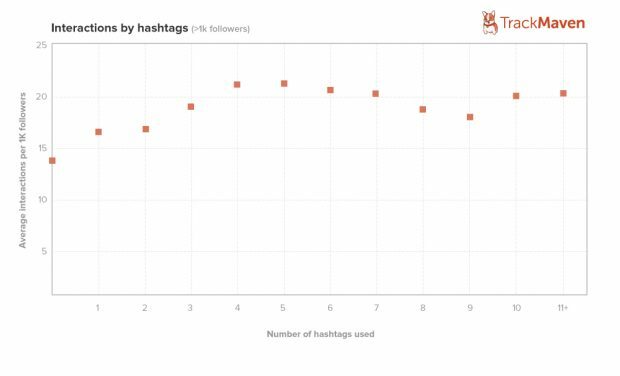 Even with posts containing 11 or more hashtags, engagement was still well-above what it was on posts without hashtags. Still, that doesn’t mean you should tag every post with 30 hashtags (the maximum Instagram allows per post). Tagging your photos and videos with the most popular hashtags will probably gain you new followers, but they’ll likely be the wrong kind of followers—spammers or people only interested in being followed back. And using too many hashtags might dilute your message and make you seem desperate. Let the content of the post decide how many and which hashtags to use. A brand or branded hashtag is a hashtag that’s unique to your business or campaign. It could be as simple as your company name, tagline, or the name of one of your products. Or it could be the name of an Instagram contest you’re running. Herschel Supply Co. uses a few branded hashtags, including #herschelsupply and #welltravelled. The latter was created for a campaign to encourage customers to share travel photos featuring Herschel products. Now tagged in more than 1.15 million posts, it is often cited as one of the most popular travel hashtags on Instagram. Hootsuite did this for our #IWorkFromHere contest in which we asked participants to upload a photo of their workspace to Instagram (or Twitter) using the Hootsuite mobile app. Because all submissions had to be tagged with #IWorkFromHere, they were automatically categorized and collected on a hashtag page. Beyond specific campaigns, Hootsuite also uses #HootsuiteLife to showcase our company culture. A review of what we’ve learned so far, plus a few more strategies to help you achieve your Instagram goals. Use specific or niche hashtags. The more specific the hashtag, the more targeted your audience will be. And a targeted audience means a higher chance of quality engagement. As we explained in our previous post, The Do’s and Don’ts of How to Use Hashtags, if you’re after Volkswagen lovers the hashtag #vwvan will earn you a lot more of your desired followers than a broad hashtag like #van will. Keep your brand hashtags short, simple, and easy to spell. That way your fans and customers can easily remember it. You want to be specific, but something like #SanFranciscoLuxuryCarEnthusiasts for a high-end auto show won’t catch on because it has too many characters. “#SFCarLovers” makes more sense in this case. Hide your Instagram hashtags. If you don’t want to clutter your captions, there are two ways you can “hide” your hashtags. Include them in the comment section below your post. Once other people leave a few comments, the hashtags won’t be viewable unless the option to See all is selected. Alternatively you can separate your hashtags from the caption by burying them beneath dots and line breaks. In the caption or comment box tap the 123 key. Select return and then enter a period. Repeat those steps at least five times. Instagram caps off captions after three lines so the hashtags won’t be viewable to users unless they tap the more option. No matter how popular they may be, you should avoid hashtags that desperately solicit Likes and followers—#followme, #like4like, #follow4follow, #tagsforlikes, etc. Using these will attract only bots, spammers, and others users who have no intention of engaging with your brand in any meaningful way. But again, that doesn’t mean you should ignore every popular Instagram hashtag trend. Tagged in over 330 million posts, #TBT (Throwback Thursday) is one of the most used hashtags on Instagram and a perfect nostalgia marketing opportunity. If your brand has a past, use #TBT to share it. If your brand is brand new, you can use the hashtag to dig into the history of your products or industry. #photooftheday: Also reserved for your best work. There’s an associated @photooftheday Instagram account that selects one “winning” photo with the hashtag each day and shares it with their more than 283,000 followers. #instagrammers: Proclaim yourself an instagrammer on Instagram! A self-evident, but popular hashtag. #instamood: Intended to be used in photos that reflect the publisher’s mood. Typically #instamood posts are not of people, but scenery. So if your brand is celebrating a big win, then you could post a photo of a fireworks display. Like #photooftheday, this hashtag also has an associated Instagram account (@instamood) that shares photos tagged with the hashtag out to their more than 27,000 followers. #tbt and #ThrowbackThursday: Explained above. #ThrowbackThursday is the longer and less common version of #tbt. More on how to make this trend work for you in our guide The Power of Nostalgia: Using #TBT for Marketing. #fbf or #FlashbackFriday – Because one day a week dedicated to nostalgia isn’t enough. The concept is the same as #tbt, although the Friday tag isn’t as popular. #FridayFunday: A chance to humanize your brand and entertain your audience with some lighter content. #regram: Use this when reposting a photo from someone else’s account to your own. Make it a part of your user-generated content strategy with our guide How to Regram: Best Practices for Reposting Instagram Content.